Expected soon is our new CD release titled ”ROAD TO NOWHERE” (label E.P. Collector, catalogue number EPC 2016-07), recorded live from the audience in Louisville, KY, May 21st, 1977. It was the second stop of Elvis’ May 1977 tour and according to Larry Geller, Elvis was in a very bad shape prior the show. Dr. Nick was present in the hotel room, using cold water with ice to make Elvis ready for concert. 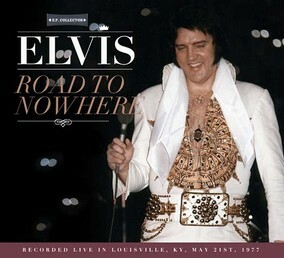 Listening to this CD, one must say that under those circumstances, Elvis did a remarkably good job! Among the concert highlights are ”That’s All Right“, „You Gave Me A Mountain“ ”Heartbreak Hotel”, ”My Way” and usual showtopper “Hurt“. The May 21st, 1977 show is previously unreleased in any form and it was never available on the collectors circuit in acceptable sound. The producers have been looking for a good sounding recording for long time. Finally they got a solid sounding tape from an Elvis collector in the USA. The CD is packaged in a nicely designed digipak filled with a positive concert review from the local press and a collection of quite decent images taken on May 21st, 1977 in Louisville, KY.
01. Also Sprach Zarathustra (2001 Theme) - 02. C. C. Rider - 03. medley: I Got A Woman / Amen - 04. That's All Right - 05. Love Me - 06. If You Love Me (Let Me Know) - 07. You Gave Me A Mountain - 08. Jailhouse Rock - 09. medley: O Sole Mio (Sherrill Nielsen / It's Now Or Never (with reprise) - 10. Little Sister - 11. medley: Teddy Bear / Don't Be Cruel - 12. My Way - 13. Heartbreak Hotel - 14. Funny How Time Slips Away - 15. Band Introductions - 16. Early Mornin' Rain - 17. What'd I Say - 18. Johnny B. Goode - 19. Drum Solo (Ronnie Tutt) - 20. Bass Solo (Jerry Scheff) - 21. Piano Solo (Tony Brown) - 22. Electric Piano Solo (Bobby Ogdin) - 23. School Day - 24. Hurt - 25. Hound Dog - 26. Can't Help Falling In Love - 27. Closing Vamp.